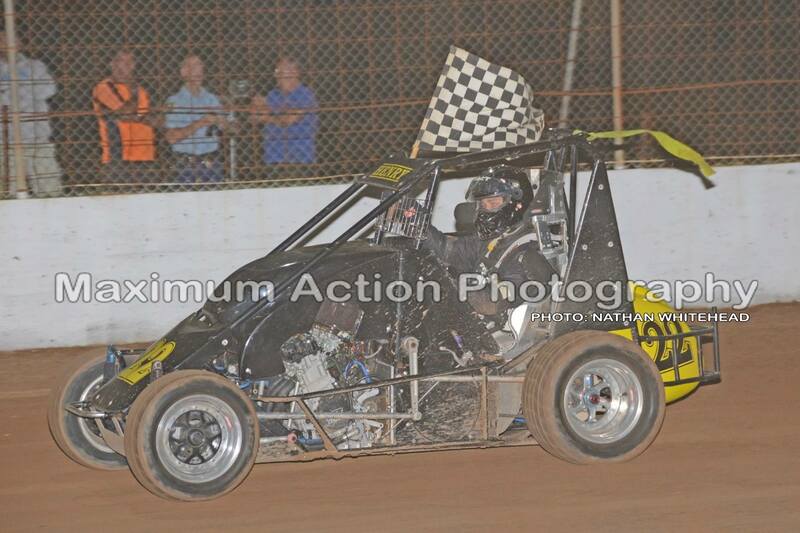 Looking for words to describe last nights Compact Speedcar racing at Nowra Speedway where the action just never stopped. With all the shenanigans going on people were looking to the skies to see if a full moon was out. It wasn’t, so an explanation is still being sort. It all started early when Rob Eyeington smacked the turn 3-4 wall and bent a rear axle on the first lap of heat 1. That parked him and the red 98 for the night. The first heat restarted cleanly with Darren Margules taking an easy win from Adam Henry and Steven Hawksworth. Heat 2 had the yellows waving a few times, the first of these for Brad Cameron who had spun and backed into the turn 3-4 wall, he was able to re-start. Carl Yenne then caused the next stoppage after climbing the left rear of Craig Hickey, again in turn 3. Yenne slid backwards towards the wall and was “T” boned by Tony Abson. As the yellows came on Tony Aulsebrook climbed a wheel and broke the shock mount putting him out for the night. Yenne was also a out with damage. The race was restarted briefly before the red was shown after Steven Hawksworth rode out one of the most spectacular crashes seen at Nowra. Thankfully Steven climbed from his wrecked car with assistance of the Nowra crash crew. The heat was declared with the win going to Simon Backman with Adam Henry and Lee Stokes 2nd and 3rd respectively. Heat 3 was the better of the races with a very heady win going to Adam Henry who held out a fast approaching Tony Abson who had relegated Darren Margules to third on the final lap. The feature tested the patience of the Nowra officials after Darren Margules twice drove under the cone on two separate restarts the last of these had Margules and Brad Cameron tangling as they crossed the stripe. The officials indicated to the drivers that they would restart with a green, white, checker. Adam Henry had managed to stay at the pointy end after starting off pole. Tony Abson was hot on his tail with Craig Hickey in third. Henry withstood the Abson taps over the the last two laps to be the second Rookie to claim a feature win this season, Hickey closed the gap to place third. Plenty of boys will have to spent some time in the sheds over the next few days to have their cars ready for their next meeting.